The unusual discovery was made at Melbourne last month in two boxes marked shoes sent through the mail in a consignment identified as coming from northern Europe. The parcel included six venomous vipers native to Southeast Asia, three ball pythons, nine large tarantulas from Mexico, Brazil and Colombia, plus Asian forest scorpions. Australian Border Force officers, in a statement Tuesday headlined "Creepy crawly cargo", said it was a serious issue as they posed a high biosecurity risk because they can carry pests and diseases that aren't present Down Under. But the Department of Agriculture and Water Resources also saw the lighter side. "This detection appears to be a clear attempt to get around the rules that are in place to protect us all," said Lyn O'Connell, a department official responsible for biosecurity. "No spider is a match for our biosecurity web, we get our tails up when there are scorpions in the mail and if you try send exotic snakes beware if we find intentional non-compliance, we bite back with the full force of the law." 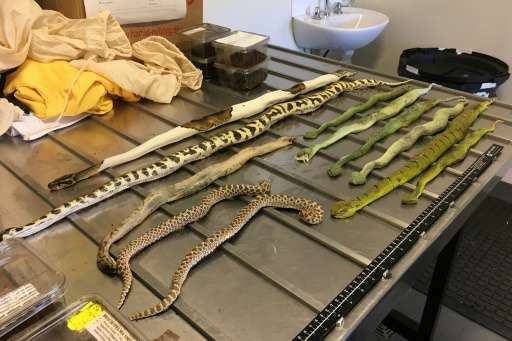 Investigations are continuing into the source of the shipment with officials believing they were destined for the black market, where live reptiles are in demand as pets.